Alphabet, aka Google, is now the world's most valuable company. Move over, Apple. Another company beginning with the letter A is now the world's most valuable company. Alphabet. Shares of Alphabet, the parent company of Google, rose nearly 4% Tuesday morning thanks to its strong earnings report. As a result, Alphabet (GOOGL) started the day with a market valuation of about $551 billion. Apple's (AAPL) stock fell 1%, pushing its market value down to $531 billion. Alphabet -- can I just call it Google in the way the Arsenio Hall barber character in "Coming To America" refused to refer to Cassius Clay as Muhammad Ali? -- wowed Wall Street with its fourth quarter results after the closing bell Monday. Sales and earnings easily beat Wall Street's forecasts. The company disclosed revenue and profits (or losses) for "other" businesses such as Nest, Google Fiber and X for the first time. Those units lost money. But that was expected. The majority of Alphabet's sales and earnings still come from its core Google operations -- things like search, Android and YouTube. And those businesses are doing extremely well. That's a big reason why Alphabet stock has held up so well despite this year's volatile market conditions. Shares are up this year -- and that follows a more than 40% surge in 2015. Alphabet's stock is now at a record high. Apple, on the other hand, has struggled to convince a skeptical Wall Street that it has any new tricks up its iSleeve. The stock is down nearly 10% this year and is about 30% below its all-time high. Even though Apple reported a record quarterly profit last week, the company warned that sales will fall in the current quarter. CEO Tim Cook also sounded nervous about the global economic outlook. 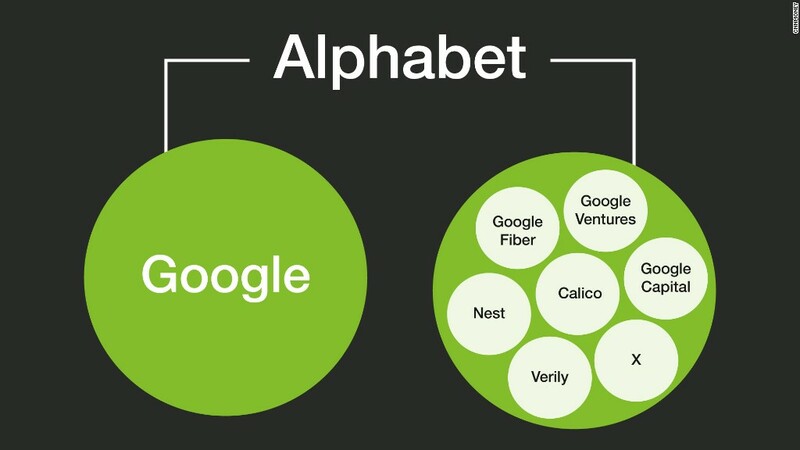 So AlphaGoogle (sorry) clearly has the momentum right now on Wall Street and Silicon Valley. At least 23 analysts raised their price target for Alphabet on Tuesday, according to FactSet Research. The most bullish of the bunch, Ross Sandler of Deutsche Bank, thinks Alphabet will hit $1,080 a share. That's a 40% increase from Monday's closing price. Some think it's possible that Alphabet will become the first U.S. company to reach $1 trillion in market value. But Alphabet still has a long way to go before it comes close to Apple's peak valuation. Related: What is Google's new Alphabet? Apple was worth nearly $775 billion back in February 2015. Alphabet would need to soar another 46% to top Apple's record market cap.